Eggplants are actually fruits, and classified botanically as berries! Asia accounts for more than 3/4 of world eggplant production. Turkey produces more eggplant than all of Europe combined. 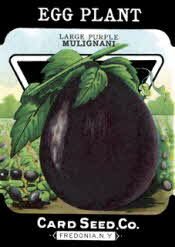 Eggplant (Solanum melongena esculentum) is a member of the nightshade family and is native to India. The early varieties were bitter, but cultivation and crossbreeding have greatly improved the flavor. Eggplant is related to potatoes, tomatoes, and peppers. Eggplants are native to India, and India and the Far East are still its largest consumers. Eggplant isn't a particularly popular vegetable in the United States, but it's a favorite in many areas of the South. Thomas Jefferson, who experimented with many varieties of plants in his Virginia garden, is credited with introducing eggplant to North America. In various parts of Europe, people suspected that eating eggplant caused madness, not to mention leprosy, cancer, and bad breath, which is why eggplant was used mostly for decoration in England and the United States nearly up to the 20th century. The name eggplant was originally applied to a white skinned variety.